Alarm systems work in different ways. Some notify you of intruders in your premises or by scaring them off through the emission of a loud audible noise. There are also many others that connect wirelessly to your smartphone for enhanced supervision. Meanwhile, some systems can alert the authorities automatically. Ranging from the simplest single-entry point systems to the most complex full home systems, here’s a list of the best available alarm systems today. The Canary View indoor security alarm system allows you to remotely keep tabs on your premises via streaming video. With a 147-degree wide angle lens, night vision and pan and zoom capability, you can view footages in full colour 1080 HD quality. Canary’s security camera is also compatible with Alexa and Google home based tech including Echo Show and Echo Spot, letting you complete your smart home. Need to take quick action? The camera lets you alert relevant authorities via its built-in one-touch emergency services. Kerui’s 8218G is a GSM PSTN mobile network alarm system suitable for both homes and offices. The system equips a TFT Color monitor for easy customization of settings. It can work with a wide range of 433mhz OEM sensors including door, smoke and gas detectors. No matter where you are, the system will automatically send an alarm notification to your phone in case of emergencies or power failures. It also lets off an audible alarm noise to discourage intruders. While the system works without any contract, just be sure that the prepaid sim-card you’ll use is valid and has enough credit to dial numbers. Sometimes the simplest solution is also the best. This doorstop alarm is a simple gadget that emits an ear-piercing 120-decibel alarm siren when. Just place it on your door and let it do its job. 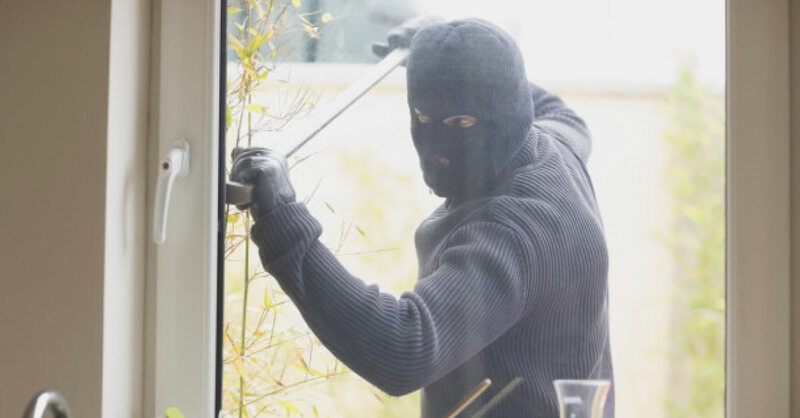 Should an intruder force the door open, it will trigger the alarm and startle them. Not requiring any wiring or technical know-how makes this alarm great for the elderly and technology challenged. Those living in high rise apartments would also be well served by this little gadget as the door is the most likely point of entry for intruders. If you need a comprehensive alarm system with multiple views of your home, you will be well served by the Z-Ben 4 Chanel 720P Wireless Security System. The system has 4 units of weatherproof WIFI linked cameras. Be on alert day and night as it is also equipped with night vision capabilities. Its auto pairing and Smart Link system makes this easy to setup as once connected, you’re ready to monitor through your smartphone. The system also supports hard disk and USB drive storage for continuous video recording. Ultra Sync offers a fully automatic alarm system that has a built-in Web Server. Not only is it easy to install and use, but there’s also a variety of security accessories including IP cameras for live streaming. While you can remotely operate the alarm through the Ultra Sync mobile app, the included remote control lets users operate the alarm without being physically present. This is especially useful for businesses with more than one location. If a simple home alarm is what you need, this one will do the job effectively even with such a low price tag. For starters, the IR infrared motion sensor alarm detects movement right away and will trigger a 105-decibel siren. Moreover, it can detect motion up to 4 meters away which is more than adequate for most homes. Operation is as easy as pie; just use the included remote control to easily arm and disarm the alarm. If you’re looking for an effective, cheap and reliable alarm system for your garage then you should check out this alarm padlock. The padlock has a built-in motion sensor that’s paired with a loud 110 decibel siren, triggered by excessive shaking or force used. Locking is quite unique, having 3 sets of keys included in the alarm set. This is because using the correct key disables the alarm whilst the incorrect keys activates the alarm. You can use the device indoors and outdoors, as it is durable, waterproof and corrosion resistant.